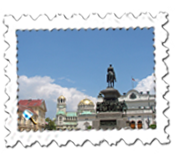 Over the last fifteen years or so, I have made a conscious decision to visit Eastern Europe and I do find it interesting. Visits have included three to Poland, Latvia, Estonia and Czechoslovakia amongst others and so Bulgaria was always going to be likely. Being a bank holiday weekend, it was the ideal length of time to go for so Sofia it was and it was far from disappointing. It was a case of deja vu after my Croatian holiday three weeks earlier. Same Travelodge at Gatwick the night before the flight, same time of departure (6 am) and up again at 3.25am. Again, grim. It wasn't either a great start to the trip mainly because of my carelessness. I had booked the easyJet flight with my Emirates points, thought that I had also pre-booked my baggage but hadn't – fair cop – and it cost me £30 to check in a case which contained little and was already broken. I was offered to pre-book online at half the price for the return journey but, on seeing that the wi-fi connection was unsecured, I thought it best to ditch the case and buy a better one with the money saved. Mean, for sure and I don't mind saying that the packing for the return journey wasn't easy at all and saw me checking in at the airport in very warm weather in a coat ( full of appliances ) and a sweater wrapped around my waist! How far can frugality go? God knows what anyone seeing me disposing of the case on a busy Bulgarian route thought either... Anyway, I digress. The flight to Sofia was slightly delayed and I really couldn't fit into the seat and was grateful that it was at least an aisle seat but it was woefully inadequate. A stag party from Wales was also on the flight and I was seated next to them. One guy kept shouting at his mate Reg: a monosyllabic drone around two hundred times which at 6.30am wasn't great news. For a while, he went for someone who had the less taxing name, "H", and not even persuasion from the cabin staff could adequately stop them. 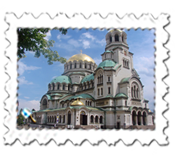 Quickly through Sofia Airport, the only inconvenience was that the money exchange was closed because, as I later found it, it was a national holiday. The hotel changed the money at a somewhat high 5% commission but there was no alternative as I had a taxi driver waiting outside. I must say that this taxi man was excellent and, although the slip of paper had told him that I wanted to go to the Radisson rather than, as I'd said, the Park Inn by Radisson, I did check with him at a traffic light when we had temporarily stopped and it was no bother to him and his approach was most commendable and friendly. The Park Inn is a delightful place. 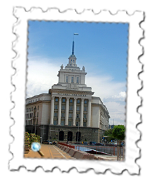 Like, it seems, quite a few of the higher grade hotels in Sofia, it isn't that close to the centre but is reasonably convenient for the last stop on the impressive metro system. I was given a very large and comfortable room and the breakfast was excellent and the staff very helpful and friendly. There seems to be a marriage season and this weekend must have been in the middle of it so it was a shame that the main restaurant was taken over by parties on both evenings leaving only a more restricted menu in the pleasant bar. Normally, this hotel would be in a quiet area but not that weekend... There was a further ceremony in the hotel across the road, a load of noise and cars veering about in the road in high spirits and it was inevitable that one collided with a taxi. Maybe it was just as well that a hospital was behind the hotel. Even with my poor hearing, it was quite a cacophony. Sofia is an interesting place. 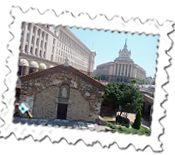 Guide books suggest that tourists going to Bulgaria head for the beaches and don't always allow for Sofia but I am pleased that I went to the Bulgarian capital. 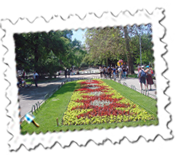 As I mentioned earlier, I enjoy Eastern Europe and, although a lot of the cities, share the same similarities such as the dark, granite monuments and impressive former Communist buildings, Sofia came across as a relaxed and pleasant city with plenty of parks and greenery. In places it is bizarre to see Roman remains almost alongside the haughty Party House, home of the former Communist party. One of the main sights is the Aleksander Nevski Memorial Church, which looks like a smaller version of St Basil's in Moscow. It certainly looked much smaller from the front and initially I was slightly disappointed. Walk around it, though, and its size and beauty quickly become apparent. I visited the spa in the Arena di Serdica Hotel. 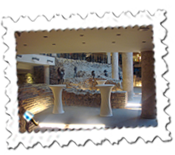 This hotel is remarkable for its archaeological remains inside the building and this aspect is also seen elsewhere notably in the Serdica metro station. The metro, whilst not yet covering all parts of Sofia and its outlying area, is extremely well-kept and impressive with high roofs and fairly modern trains and is not dissimilar to the Russian metro ( which I must admit to not having been on for almost thirty years). 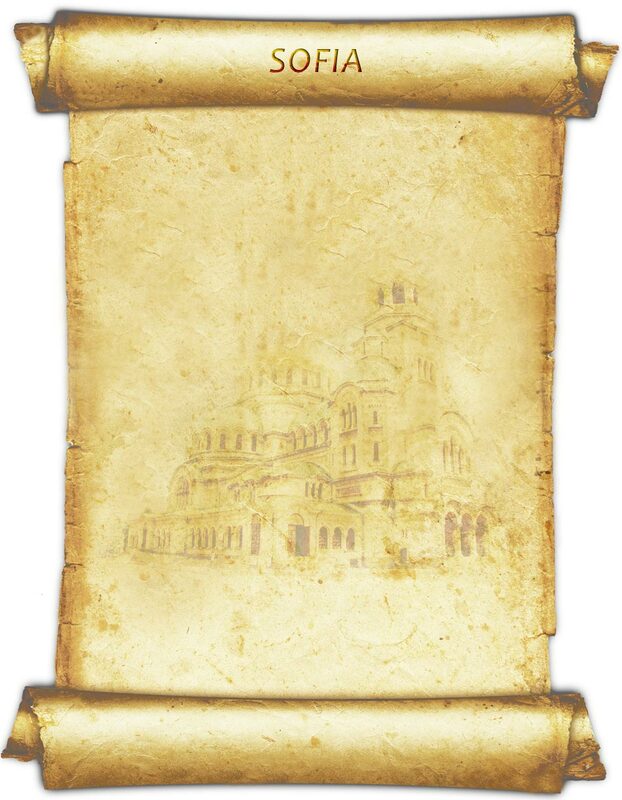 There are churches and buildings with a distinct Greek or Russian feel to them whilst the occasional vast column so typical of Eastern European countries rears up and surveys some of the city. On the Sunday, I had a walk towards Vitosha Mountain which looms behind Sofia giving decent views of the city the higher up you go. I probably managed twelve kilometres there and back and it was certainly very nice. 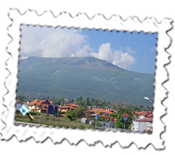 There are hiking trails available and adds another reason for visiting Sofia. I'm like the proverbial tourist magnet ubiquitously on sale: drawn to cheap souvenirs... My house does probably come across as a shrine to my travels, quickly running out of space but there was always going to be space for a plate from Sofia bought in a subway which gave respite from trying to cross the busy roads. After passing up the nocturnal opportunity to dispose of my case in one of the many dustbins lining the streets, I did so on the last morning in broad daylight and managed to somehow cram most of my belongings into every available space and pocket. I'd expected a bit of trouble at getting it all through and on to the plane but it didn't materialise. It was just a shame that a very affable young taxi driver who spoke excellent English short-changed me. There was a suspicious look in his eye as he gave me loads of notes knowing damn well that I wouldn't be bothered to check but, later on in the Duty Free shop, I really should have said something when charged an obviously wrong amount based on a very poor exchange rate. The queue had been so long and time-consuming that I wrongly let it go. Relieved at getting everything on to the plane unchallenged, I even found that my aisle seat seemed more comfortable than on the outbound journey although being towards the back of the plane again. I settled down with a beer, started to read a book when I looked up to see a familiar face. It was Reg with his less-than-merry crowd looking a little worse for wear so, this time, they were far less raucous and the plane arrived early into Gatwick.